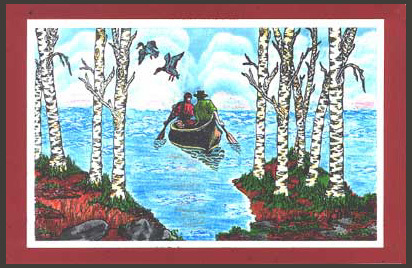 Stamps used are “Birch – Two Straight, Lg.”, “Birch – Two Crossed, Lg.”, “Birch Grove”, “Two Ducks”, lower part of “Ship” stamp used for waves, “Canoeing”, “Rock” (Retired stamp not in current catalog, email for availability), “Rocks & Grass”, “Wild Grass.” Colored with markers and pencils. Card by Margaret Wiggin. Stamps used are “Caribou, Lg.”, “Rocks & Grass”, “Large Brownie Rock” and “Pine Silhouette.” The clouds are sponged using a stencil. 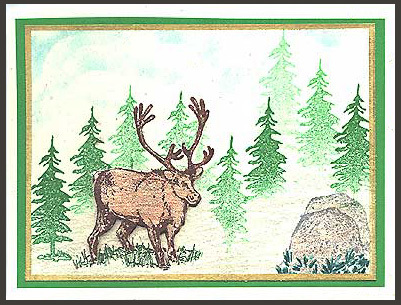 The caribou is stamped once on ivory card stock, then stamped again, cut out (except for the antlers) and mounted with foam tabs to give a 3-D effect. 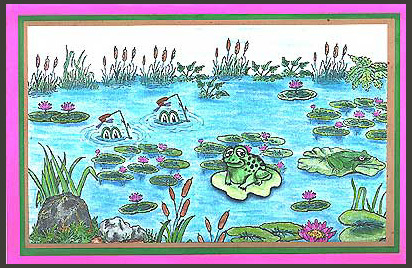 The images are stamped in color and colored with pencils. The card is edged with a gold Krylon Leafing pen and layered on green card stock and confetti card stock. Card by Mary Hansen.